The Hunter’s quest for the truth of his forgotten past leads him to the desert of Adavast. To find the answers and reach the twelve kingdoms on the other side, he’ll have to cross the parched wasteland. Now accompanied by the innocent Halien, a young boy whose presence helps to banish the murderous demon living inside him. For the Hunter is Bucelari, half-human/half-demon. Possessed of a deadly dagger called Soulhunter and driven to kill by the demonic voice inside him. But every time he slays with the dagger, though it strengthens and heals his body, he brings the dark god Kharna one step closer to reviving and destroying the world. But to find the answers of his past and protect Halien’s life, the Hunter will be forced to use the dagger to satiate his driving need and protect the innocent child. The Hunter’s war with his nature only intensifies in the third book in the series. He tries so hard not to kill, not to feed his addiction. He knows the cost, he doesn’t want to see the world end, and yet time and time again circumstance and the whispering voice drives him to use what will one day doom the world. Unless he finds the answers in his past. Peloquin peels back more of the Hunter’s past as well as the activities of the Demons. The world grows larger, and the Hunter’s goals ever sharper in stopping their plans and finding out just who he truly is. Even if that person is someone he may not like. The setting maintains the Grimdark ascetic with Halien providing a glimmer of hope in the dark tale about addiction and redemption. The Hunter struggles hard to fight his need, and Pelonquin does phenomenal job translating that battle to the page along with keeping the story moving at a high-neck speed that keeps the pages turning. If you’re a fan of Grimdark Fantasy, Pelonquin is an author you have to read, and the Last of the Bucerlari is a phenomenal entry. I can’t wait for book four! 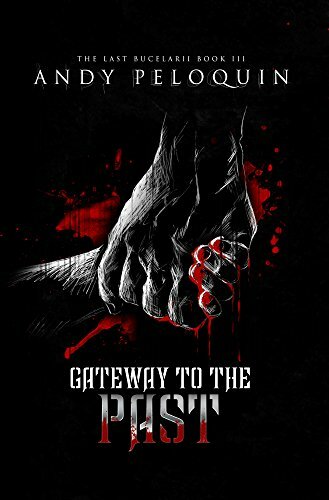 You can buy Gateway to the Past from Amazon. Check out Andy Peloquin’s website, connect on Linked In, follow him on Google Plus, like him on Twitter @AndyPeloquin, and like him on Facebook.